Ornamental plant with delicious fruit. Carrotshaped 5" long peppers are borne on sturdy plants. Fruits ripen from deep green to golden-orange. Firm crunchy flesh is mildly peppery and sweet. 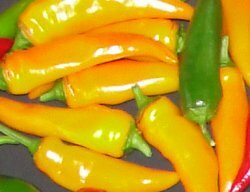 Delicious as a frying pepper or eaten fresh. Sweet and flavorful.